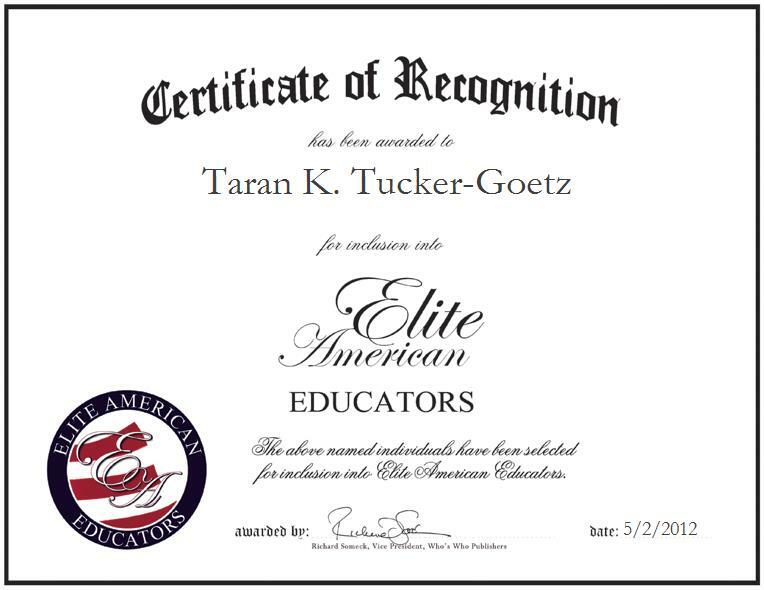 Taran K. Tucker-Goetz possesses a refined background in special education, Mrs. Tucker-Goetz teaches mathematics and language arts to sixth- and eighth-grade students with special needs. She also coordinates with staff members and schedules meetings, and she has garnered a reputation of distinction for her diligence, poise and self-belief, and for her commitment for instilling these characteristics in others as an educator. With more than 36 years of professional experience under her belt, Mrs. Tucker-Goetz shines in her current capacity, as her work has led her on a journey through Kansas to New Mexico, with her now serving as a teacher of special education and staffing coordinator for El Paso School District #11. In her prior position, she worked for the Special Education Department of the State Department of New Mexico. At present, she supports a myriad of worthy causes, which include the Special Olympics. She feels that she has been able to achieve success as an educator due to the support that she receives from her family. Mrs. Tucker-Goetz received a Bachelor of Science and a Master’s Degree in Elementary Education from The University of Kansas. She is survived a battle with breast cancer and is doing very well in her recovery. She unfortunately lost her husband to his battle with cancer, and she currently resides with her teenage son who aspires to become a doctor someday. Mrs. Tucker-Goetz has strong family values and is looking forward to the next phase of her life journey. She loves to travel and one day hopes to live in Hawaii where she can enjoy her retirement.